With the PPro8 Alert List Editor, you can set up an array of equity alerts based on price, size, volume, and more. 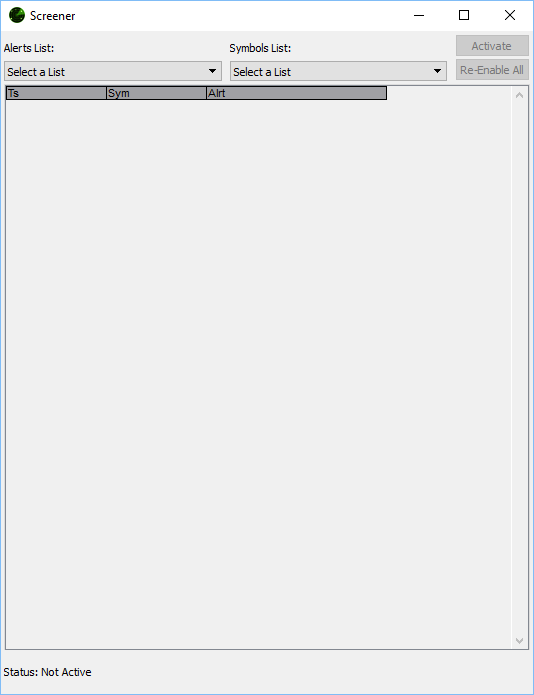 The Alert List Editor works with the Symbols List Editor and Screener. 1. On the PPro8 toolbar, click AlertListEditor. 2. The Alert List Editor window appears. The Alert List Editor window is divided into two panes: Lists and Alerts. Use the Symbols List Editor to create a new symbol list and use it as the basis for an alert. 1. Open the Symbols List Editor. ii. Type a unique list name in the Enter Symbol List Name Window, and then click OK.
iii. In the Symbol column, type a symbol or a list of symbols, and then press Enter. ii. Select a CSV file from your computer. 3. The symbols list is ready to use for adding an alert. Refer to the Symbols List Editor manual for more information. Use the Alert List Editor to create and edit alerts, alert groups, and alert lists. 1. Open the Alert List Editor. 2. In the Lists pane, click New. 3. The Alerts Name Input Box appears. Type a name for the alert list, for example, “NQ Alerts”, and then click OK.
4. Several menus and a field appear in the Alerts pane. 7. To set a sound effect for the alert, select the Alert Sound check box, click the (…) button, click a WAV sound file in the media folder, and then click Open. 9. The Save Dialog window appears. Click Save to save changes, Discard to discard changes, or Cancel to cancel changes. 10. The alert and alert sound effect are set. Note: only one sound effect can be used at a time for all alerts. 11. Create new alerts and alert groups, or delete them as needed until the alert list is set according to your preferences. 12. Open the Screener to screen and monitor alerts. A single alert list can have up to 3 alert conditions: these alerts will have the AND condition, which means that the alert will trigger only when all conditions occur. A single alert list can have up to 3 alert groups: these groups will have the OR condition, which means that the alert will trigger when one of the group conditions occurs. A single alert list can have up to 3 alert conditions and 3 alert groups: these alerts will have the AND and OR conditions which means that the alert will trigger only when all conditions in a certain group occur. With the PPro8 Screener, you can screen alerts set up with the Alert List Editor and monitor stocks by timestamp, symbol, and alert name. Multiple Screener windows can be open at the same time for multiple alerts. 1. On the PPro8 toolbar, click Screener. 2. The Screener window appears. 2. In the Alerts List menu, click the name of the alert list you created with the Alert List Editor. 3. In the Symbols List menu, click the name of the symbols list you created with the Symbols List Editor. 6. Click Stop to stop the screener. When the alerts are activated, click Re-Enable All to reactivate. 7. When the alerts are activated, click Re-Enable All to reactivate. To make changes to the Screener settings, right-click anywhere in the Screener window to open the Screener Customization. This window shows one tab on the left: Display. Use the Display pane to group the Screener with other tools, such as a Stock Window, a Chart Window, or a Time of Sales. Select the check box for Link Window To Group Number, click or type a group number, and then click OK to save.